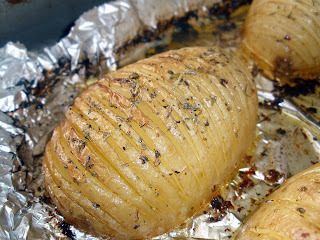 Hasselbacks are gorgeous looking and are crisp on the outside and soft and smooth on the inside. All you need is good round fat, oblong potatoes, EVOO, seasalt and pepper, butter and a good pinch of oregano. Simply preheat oven to 200°C. You can choose to peel or not peel the potatoes. Cut each potato in half, lengthways. Place a wooden chopstick in parallel with the potatoes, flat side down. With a sharp knife and using the wooden chopstick as guide, slice the potatoes as thinly as possible (as evenly too if you can!). Continue making slits on all the potatoes halves, about 1-2mm apart. Gently arrange them on a baking dish and spray them with EVOO and brush them with butter. Season with seasalt and pepper and scatter the dried oregano across the potatoes. Bake them for an hour or so until theyare very tender. Brush them with pan juices from time to time and bake until golden brown. I will surely want to do this. You definitely don't watch Rachel Ray's show. EVOO is a short term for extra virgin olive oil. Oh..I see. I going to make this now. Thanks! Faster go make, you'll love it!!! This recipe is so different and a lovely new way for me to cook potatoes other than roasting and frying. :D Thanks! Sanjana and Kitchen Flavours, thank you very much and there certainly isn't much of a recipe here. Just simple EVOO, salt and pepper and perhaps a touch of herbs to lift up these beautifully fanned Hasselbacks! Try it and I assure you you'll like it. I wish your blog has an English version! I did it. At least, I found time to cook your recipe. (My to-do list is so long and becomes longer and longer). You are right we appreciate these potatoes. Many thanks for sharing this. Glad you like this simple keepsake potato recipe. Have fun with it and yes, all your pictures look so good I cannot make up my mind on which one to translate. Perhaps you wanna install a translator for me?? ?